A longer version of my review in Surgeons’ News. When should a clinical study be considered a landmark? Must it have changed practice? Does the strength of the study have a bearing – should only randomised clinical trials be considered, for instance? The new Landmark Papers series from Oxford University Press has volumes in Neurosurgery, Cardiovascular Medicine and Nephrology. 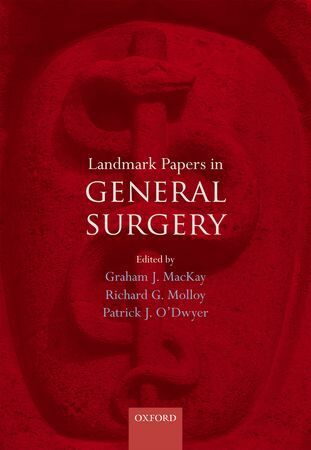 A book covering General Surgery from authors based mainly in Glasgow is hot off the press. The editors have done a great job in producing a clean, well-structured, easy to read book that will be of use to both practising surgeons and trainees. The book is divided by general surgery subspecialty with each chapter containing a number of themes. In emergency surgery, for instance, sections include CT assessment of the acute abdomen and laparoscopic versus open appendicectomy. An important study addressing the theme is provided, sometimes together with related references. Following a brief description, study design and results are tabulated, after which conclusions and a critique are made. Before opening the book I wondered whether there may be a problem in its conception: in the modern world of the systematic review and meta-analysis, what is the place of a book in which surgeons highlight a single publication in a deliberately unsystematic manner? Is this not harking back to the days when one cites evidence fitting ones prejudices, ignoring troublesome contradictory reports? Actually, rather than a problem, I found this refreshing. This analysis of individual trials in a detailed manner is reminiscent of the journal clubs we struggle to maintain in our busy modern practice. Despite being an advocate for the systematic review, too often the focus is on the certainty surrounding a point estimate of outcome. This book highlights the importance of clear consideration of the intention of a trial, whether those aims were achieved, what biases exist and ultimately whether the results apply to my patients or not. In any case, in areas where conflict exists, multiple trials are often described and the balance of interpretation discussed in the critique. Another concern was that it would date almost as soon as it was published. With 140 000 citations being returned from the Pubmed database for an all-fields search for “surgery” in 2012, how can a static publication like this hope to remain relevant? Again, on the whole this concern was unfounded. A condensation of the evidence for surgery, such as this, shows that the pace of change is slower than we possibly recognise. While the majority of included trials are from the last 15 years, there are fewer than I expected from, say, the last 4 years. A publication such as this puts itself up there to be criticised for the omission of studies deemed important by a reviewer, and it would be remiss of me not to comply. Actually, the editors have done a good job and irritatingly I found it difficult to identify big omissions. On pulling up the top 50 most cited papers in surgery, I found the great majority had been included. In my own (small field), the landmark paper by Mazzaferro on the surgical treatment of hepatocellular carcinoma has been cited more than most other surgical papers (2400 times) and warrants inclusion. The classification of surgical complications by Dindo and Clavien is at number 11 in my top 50 and probably deserves mention. The editors have achieved their aim with this book and I would recommend it unreservedly. Minor niggles are the truncated “et al” citations – give us the whole citation so we can see the senior author please. No graphs are included which is fine, but where the main study is a meta-analysis, including the forest plot for the primary outcome measure conveys information better than a table. Finally, is there a digital version of this book? I circled the Oxford website in vein but could not find a page where it is possible to buy one. Must a landmark paper have changed practice? No, as illustrated by the neat discussion on the GALA (general versus local anaesthetic in carotid endarterectomy) trial – an example of a landmark randomised trial that has not changed practice. Must a landmark paper be an RCT? No, as the classic level 4 evidence for total mesorectal excision by Bill Heald demonstrates – some observational studies have done more to alter practice in surgery than many RCTs.